Flappy Crow is back! " Flappy Crow Blood Bird: new flapping bird game ". But now instead of a miniature bird you have to play for a large and strong crow. Fly into the distance through a dark forest full of sharp saws. Fly as far as possible before you die. Score maximum points and overtake all your friends. But be warned - it will not be easy! How long can you fly? How long will you be able to stretch in this dark forest? Download " Flappy Crow Blood Bird: new flapping bird game " and find out! Compete with your friends to check which one of you will master better with such a large bird. 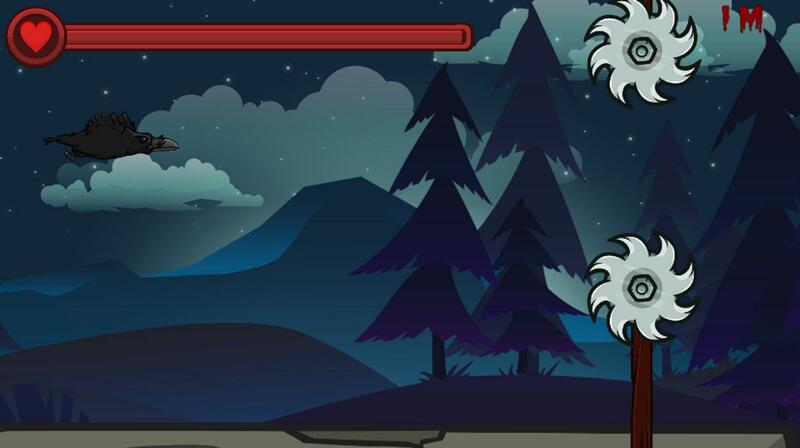 In the game you will find colorful graphics, intuitive gameplay and lots of fun! 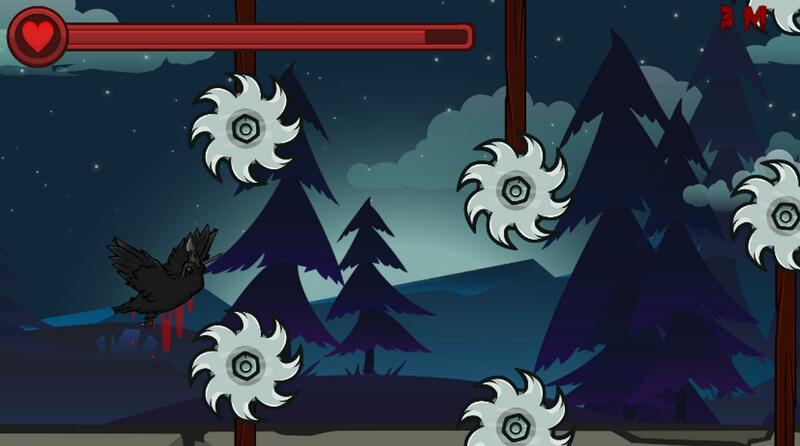 As soon as you click on Play, you will find yourself in a dark forest with lots of circular saws. You need to fly forward, trying not to hit the tip. To do this, flap the wings of a crow while tapping the screen. The game has gravity: if you do not tap on the display, the bird flies down. Circular saws surround you from two sides: top and bottom. You need to fly in the middle between them, the word balance. Even if you soar up a bit, the crow will get hurt. If you even go down an extra millimeter, the same thing happens. You need to adjust and fly as far as possible. 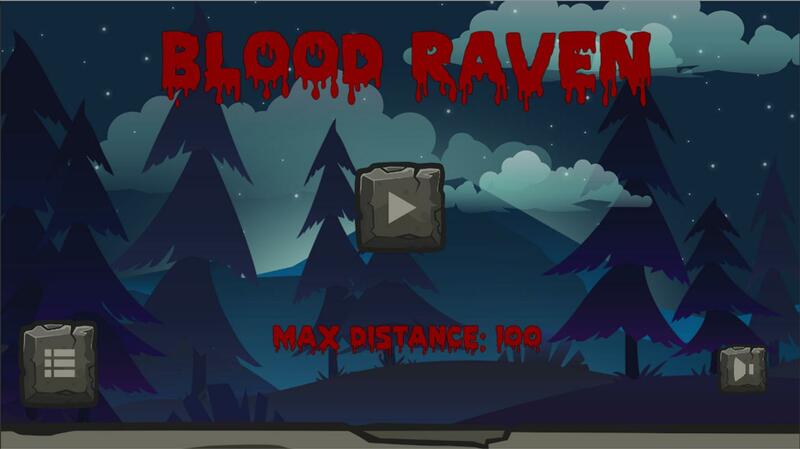 The game " Flappy Crow Blood Bird: new flapping bird game " is made in the runner genre: it is infinite, which means it is impossible to win here. But you can fly as much as possible and compete with your friends! If you played the usual Flappy Crow Bird, then the mechanics should be clear to you. But in the standard version, the bird died if it hit the pipe once. In our version, everything is different. In the upper left corner you will see a health bar: it will be wasted every time you hit the saw blade. Raven is a hardy bird, so you can get hurt several times in the game, and it will survive. If you get hurt about the saw too many times and spend the entire health band. If you soar too high (literally off the screen). If you stay idle and just sit on the stone curb. In the upper right corner shows the counter. It displays the distance you have flown. Colorful picture. The bird is very well traced. The same can be said about the forest and circular saws. The picture is not only colorful, but also smooth, which allows you to enjoy the gameplay to the maximum. Bright soundtrack. You will fly to the accompaniment of forest crickets and grasshoppers. Each wing flap is accompanied by a corresponding sound. When the raven hits the tip of the saw, he caws loudly. All this adds realism to the game. Simple control. As in the standard Flappy Fun Crow Bird, management is as easy as possible. It is only necessary to tap on the screen, flying up the raven up. If you want the bird to go down a bit, then do nothing. Flappy Fun Birds: The Crow impresses with its simplicity. For all ages. Our version of " Flappy Crow Blood Bird: new flapping bird game " is suitable for people of any age. Thanks to the nice graphics and simple controls, even children can play it. The game perfectly kills time and improves concentration. Minimum requirements for the device. The application takes only a few megabytes and does not require a powerful processor and video card. You can run it from any modern Android phone or tablet. Stop reading the description! You will understand everything when you start the game. Install it right now and let it distract you from pressing problems for at least a few minutes!
" Flappy Crow Blood Bird: new flapping bird game "